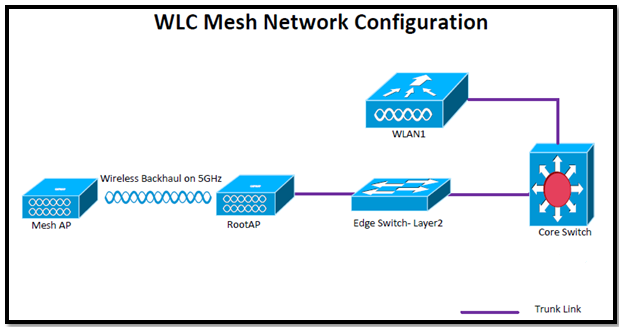 In this post we will learn about the configuration guide point to point wireless bridging using the Mesh Network solution from WLC. Right now I have both AP connected to WLC in local mode. 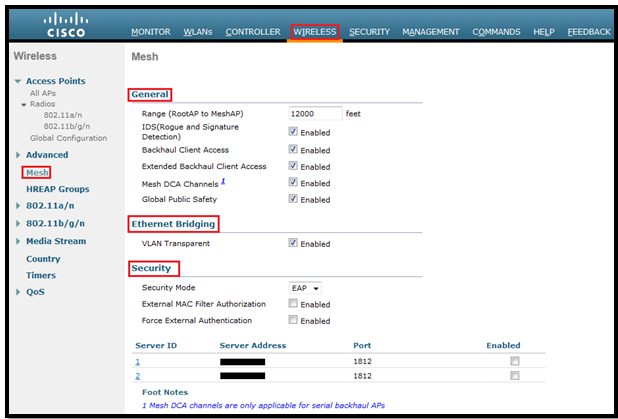 An AP in mesh mode needs to be authorized to join a controller. So the first step is therefore to add there mac address. 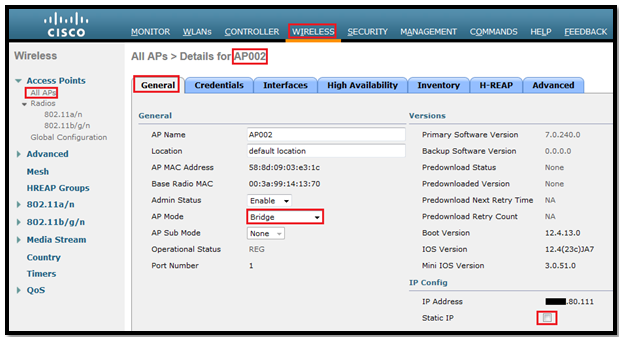 Before converting to bridge mode we must add the mac address of the both APAP in Policies list or the MAC filtering list. From Security > AAA > AP Policies, click Add. Don’t use static IP address especially on MAP. From Security > AAA > AP Policies, click Add. Now place both AP into Bridge mode (just another name for Mesh mode). After selection of Bridge mode we must apply it. Then both AP will reboot. 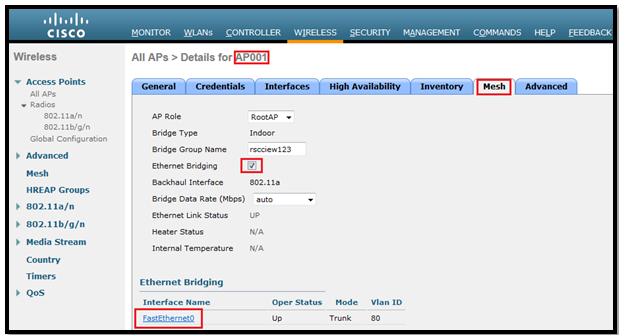 Once the AP reboots, a new MESH tab is available under: Wireless > All APs, click on AP1 or AP2. Here are few boxes which we should remember. 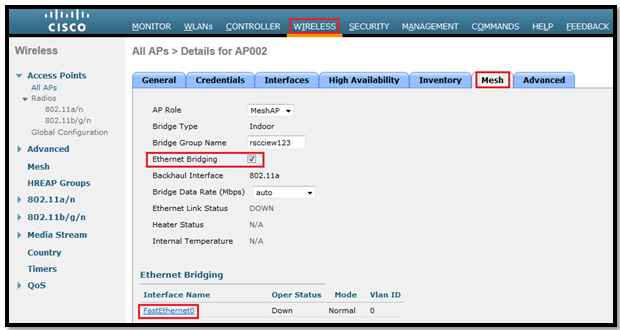 In Mesh tab, configure the rest of the AP settings. And Apply. The APs will go through reboot again, and will take few minutes to rejoin to WLC. *** MAPs use Adaptive Wireless Path Protocol (AWPP) to determine the best path through the mesh APs to their WLC. The protocol takes path decisions based on both link-quality and number of Mesh hops. To prevent AP2 from simply connecting back up to the WLC through its wired port, Either place AP2 into VLAN 100(Not routable) or make the wired port shut for AP2, so that it has no path to the WLC except though its radios. 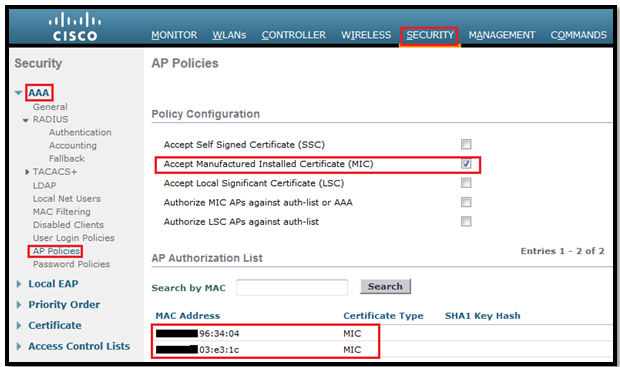 This is not mandatory- (When the APs come back up, AP1 will do another MAC auth. But AP2 will do a user auth. See the SNMP trap logs for the user name, and then create a local user with that name and make the password identical to the name. )We can see this error in trap log on WLC. Now my Both AP is up. *** MAP is in Maint state, which indicates it has found a parent. We can also force MAP to use specific RAP for the best path: How to configure it. Normally this parameter applies to outdoor mesh access points to report Rouges to Controller. It applies to APs with 2 or more radios. 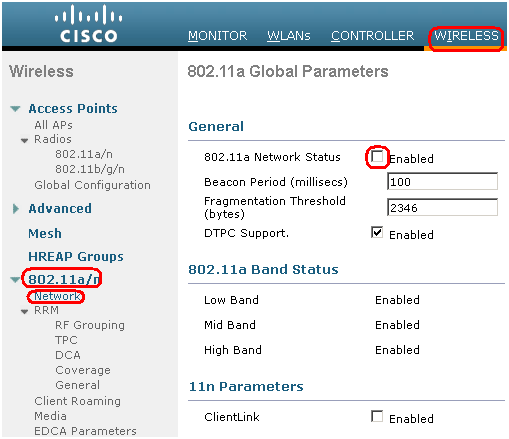 When it’s disabled, 11a radio -> backhaul, 802.11b/g -> Client associations. When Extended Backhaul client access is enabled, even slot 2 can be used for client associations. When we change the channel under RRM then MAP will not detect this and they will continuously use that channel, so if we enable this feature the MAP will detect the channel change on RRM. The VLAN tagging only works on non-backhaul Ethernet ports. 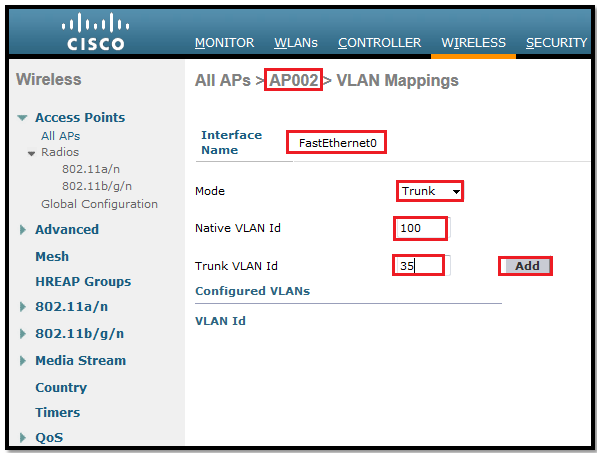 When this feature is disabled, all packets are tagged as non-VLAN transparent or VLAN-opaque . This implements VLAN tagging. PSK or Local EAP authentication is performed within the controller if External MAC Filter authorization parameter is disabled. If the MAC address is not found in the local MAC filter list, then the RADIUS server is checked. When this is enabled along with External MAC filter authorization the RADIUS server decisions override the local MAC filter list. Ethernet Bridging: By default it’s disabled, traffic from MAP Ethernet is blocked on Backhaul. To allow traffic from MAP Ethernet we have to enable this feature on both RAP and MAP. ***Note: By default Ethernet bridging is not allowed, it’s dropped on RAP Ethernet port, untagged. 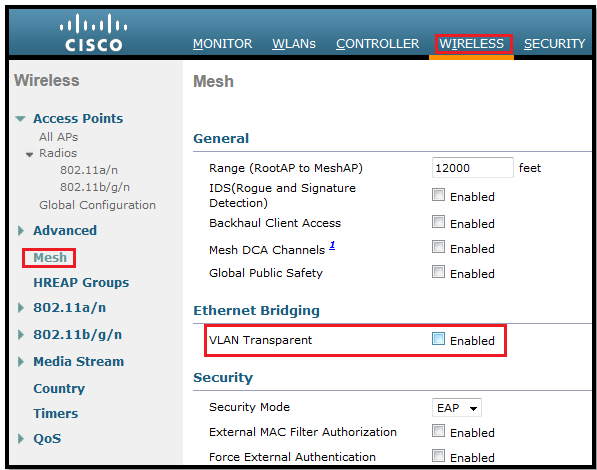 To allow VLAN tagging we must disable VLAN Transparent option (Wireless > Mesh). Once we disable it VLAN tag will be accepted. Now we will see the Ethernet interface under Mesh Tab, Click on it. Same we have to do on MAP. Make sure that port for RAP and MAP configured as Trunk. In this post we will see the SNMP configuration on WLC to add to WCS/NCS or Prime INfrastructure. Simple Network Management Protocol (SNMP) is an application layer protocol that provides a message format for communication between SNMP managers and agents using UDP ports 161 and 162 for sending and receiving SNMP traps. 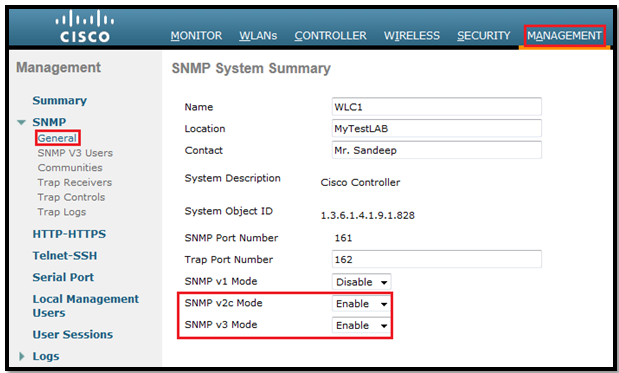 Configuration SNMP on cisco WLC via GUI & CLI. First login to WLC (After configuration via CLI or GUI) then go to Management > Summary Tab: This shows the summary of management section. 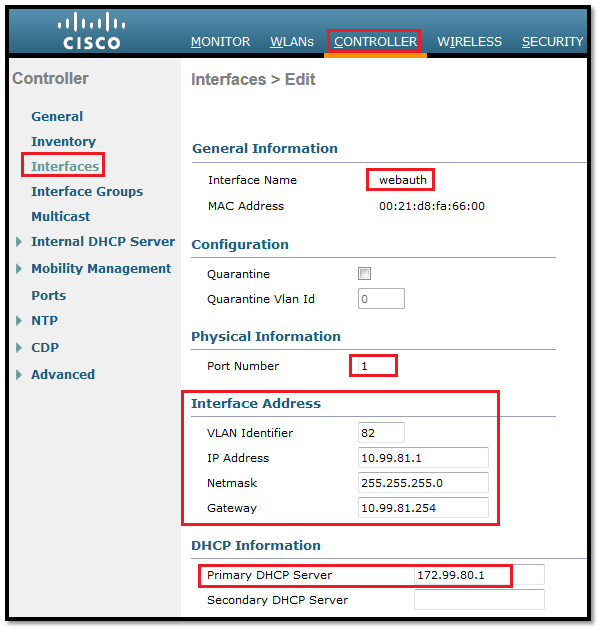 As we are aware that to connect with WCS/NCS/PI, we must enable SNMP v2c / SNMP v3 mode and can fill/change other information like: Name, Location and Contact person. 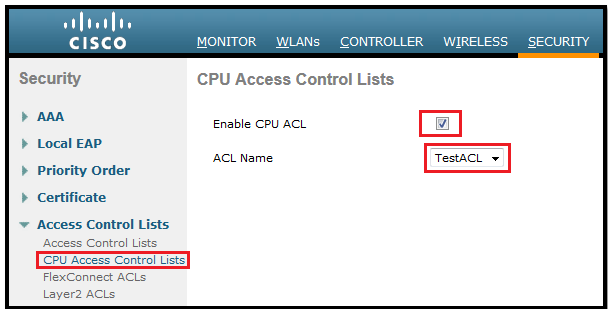 (WLC1) >config snmp  version v1 ? (WLC1) >config snmp  version v2c ? (WLC1) >config snmp  version v3 ? Now let’s start with SNMP communities section. Before creating a new SNMP community, we must delete old “Private” SNMP community due to security issues. Now we will create a SNMP community and other information. We must enter the NCS IP address (if some other IP then make sure that our NCS server must come in the range of IP we configured). Access mode can be Read only or Read/Write. (WLC1) >config snmp community ? 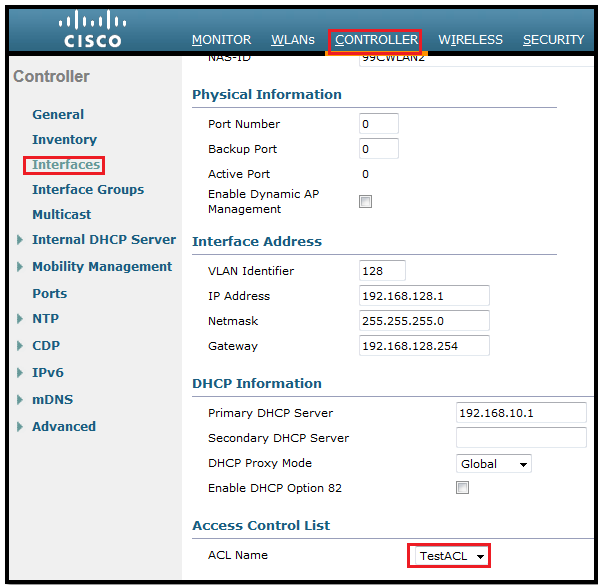 accessmode     Configure the access mode (read-only or read-write) for a SNMP community. create         Add a new SNMP community. delete         Delete a SNMP community. 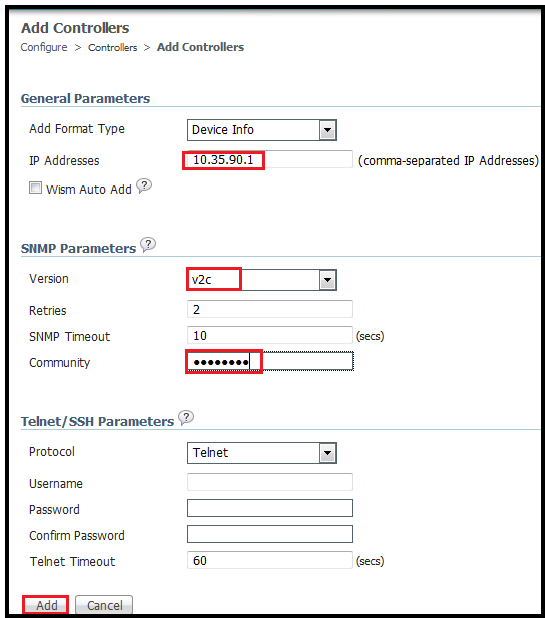 ipaddr         Configure the IP address and mask to be accessible for a SNMP community. 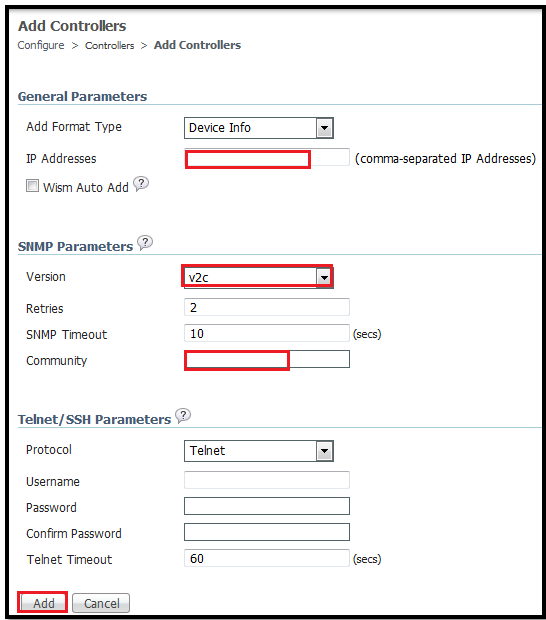 mode           Enable or disable a SNMP community. From a security point of view, it is recommended to run SNMPv3 with the default username changed or disabled or deleted. 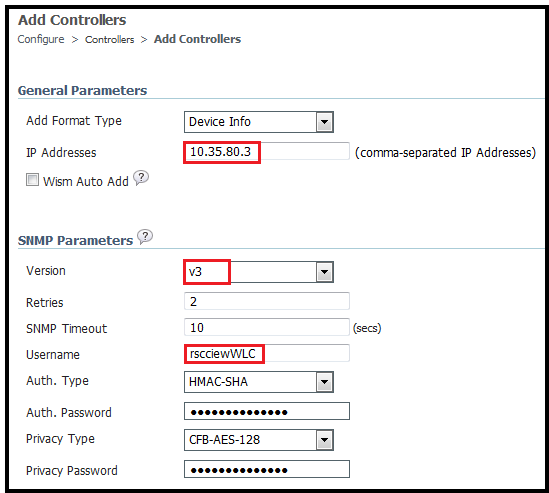 Keep in mind that our SNMP settings must match between the controller and the wireless/network control system (WCS/NCS). Also, we should use an encryption and hash keys that match our security policies. ***Make sure that we must delete the default snmp v3 user profile due to security reasons. 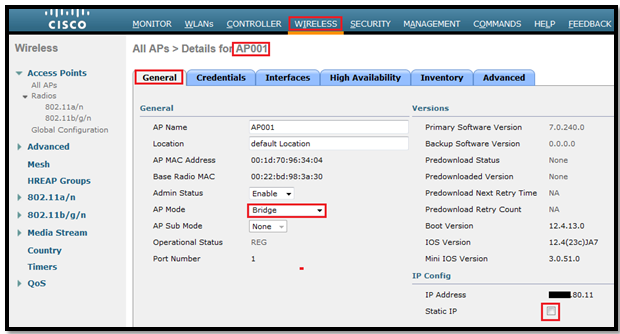 In the same section under Management > SNMP, we can also configure SNMP Trap receiver/Trap control/Trap logs. We can control which SNMP traps we want to send to this trap receiver via Trap Control section under SNMP. Now we will try to add our controller to WCS/NCS via SNMP v2c mode and SNMP v3 user. Now we will remove again and try to add with SNMPv3 user name. That’s all about SNMP configuration. 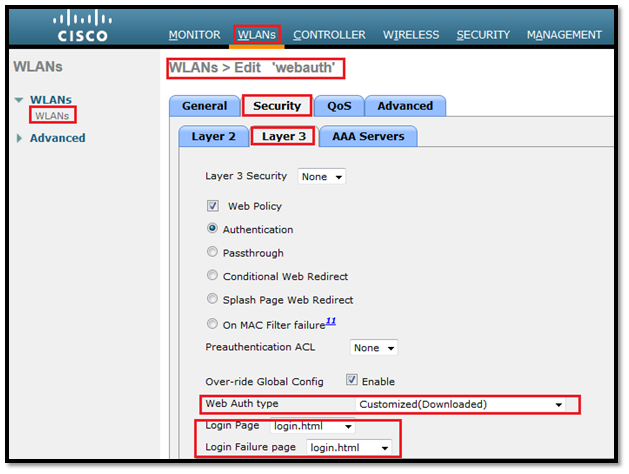 In this post we will see how to implement and configure WLC to support internal Webauth. Web authentication is a Layer 3 security feature that causes the controller to not allow IP traffic (except DHCP and DNS -related packets) from a particular client until that client has correctly supplied a valid username and password. Web authentication is mostly used to deploy a guest-access network. We must remember that web authentication does not provide data encryption. Webauth is an authentication method without encryption. In this post we will only see the starting 3 ways because I don’t have any external webserver. Create a dynamic interface and fill all the required details. Create a WLAN and apply the settings. 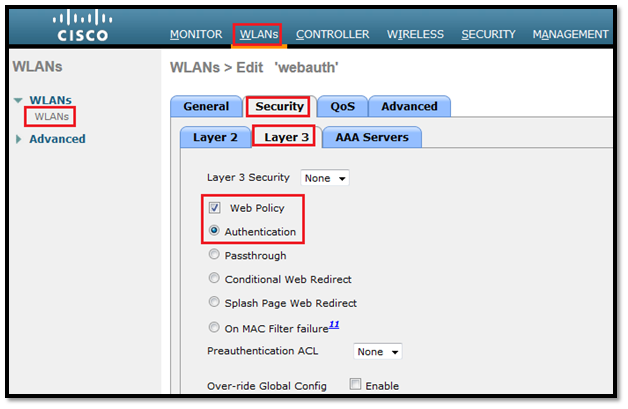 Configure WLC for Webauth (Internal). Create local user for testing. 1. Create a dynamic interface and fill all the required details. 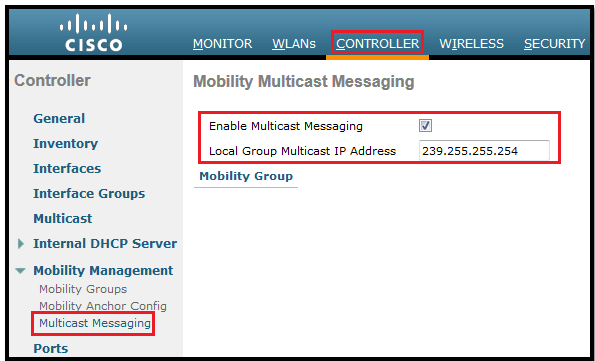 From the WLC GUI, click WLAN in the menu at the top, and click New on the upper right side. This page will appear. 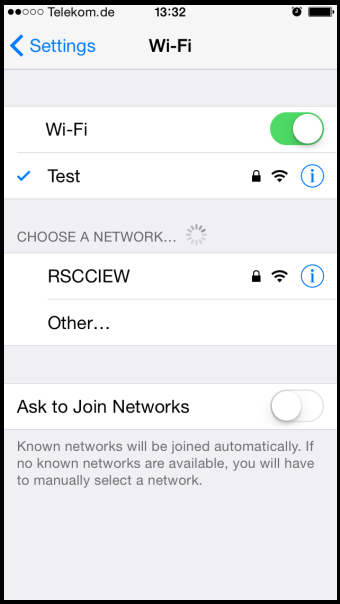 Fill Profile name and SSID. A new WLANs > Edit window appears. Check the status box to enable the WLAN. 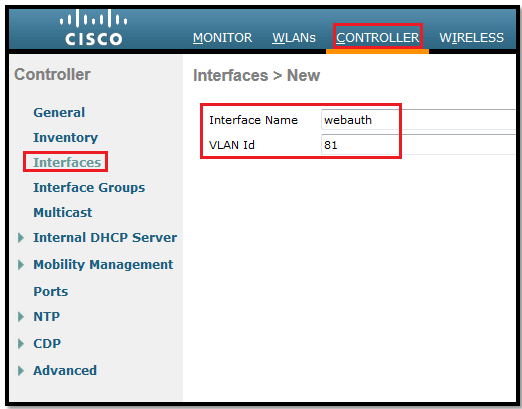 From the Interface menu, select the name of the VLAN interface (webauth) that we created above. Check the Broadcast SSID box. Click Layer 2 security and set to None. Check the Web Policy box and choose the Authentication option. Then click Apply from upper right side to save changes. 3. 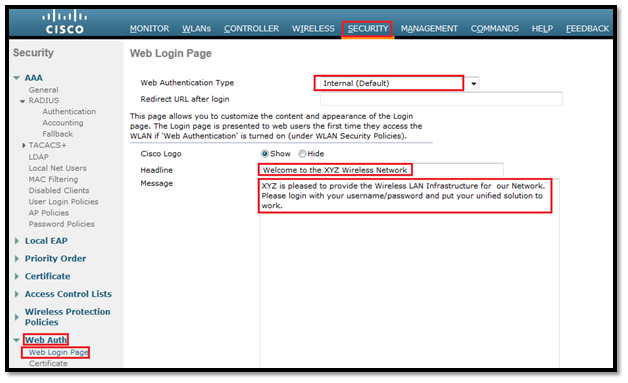 Configure WLC for Webauth(Internal). 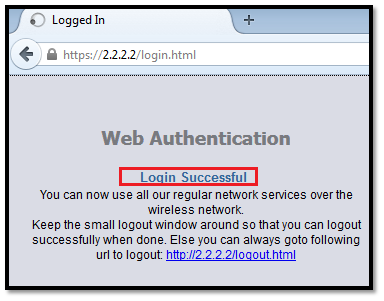 Internal web authentication is the by default web authentication type on WLCs. NO need to change the configuration. 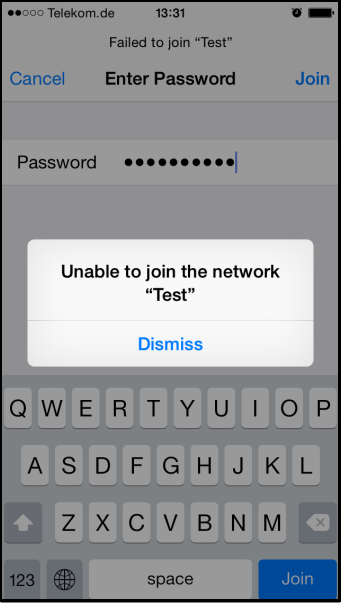 In this post we will tests with Local authentication. 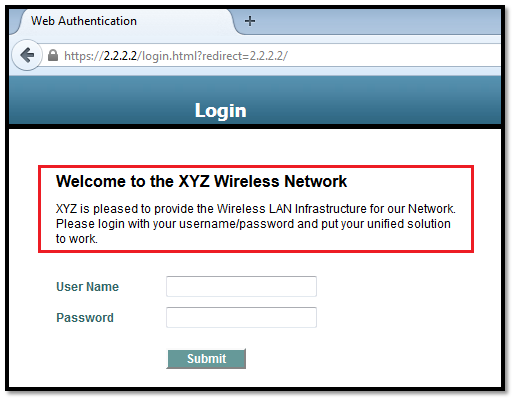 Enter the username, password and WLAN profile from drop down box. 1. Connect with Webauth WLAN. 1. 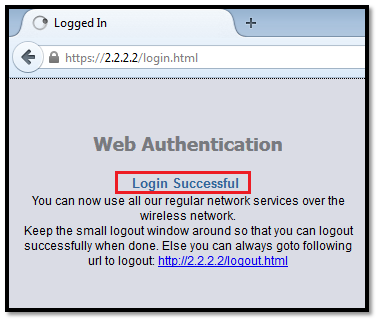 Login to WLC and modify the default login window by choosing Security > Web Auth > Web Login Page and click on Apply to save it. I changed the headline and message content. 2. 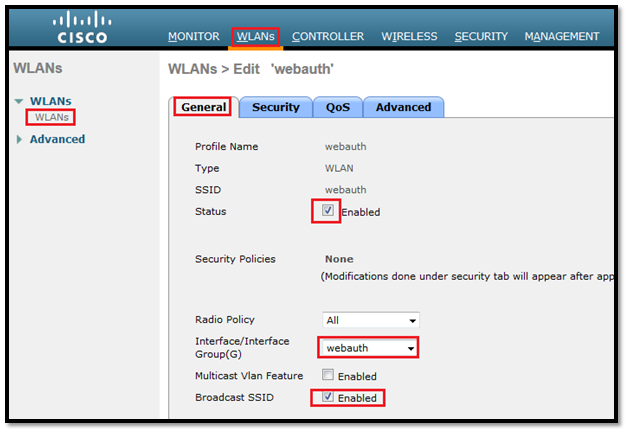 Now connect to webauth WLAN. Login page will appear like this. 1. To download a customized login page, first start a TFTP/FTP server and put the login page in their root directory then login to WLC GUI, click on Commands and the details. 2. Change the WLAN setting. Choose Customized (Downloaded) webauth type from drop down box and select the login and login failure page then click apply. 3. Connect to WLAN “webauth” then this login page will appear. 4. Enter the username/Password and click on I agree with Policy Above. • We open a web browser and enter a URL, http://www.google.com. The client sends out a DNS request for this URL to get the IP for the destination. The WLC bypasses the DNS request to the DNS server and the DNS server responds back with a DNS reply, which contains the IP address of the destination http://www.google.com. This, in turn, is forwarded to the wireless clients. • The client then tries to open a TCP connection with the destination IP address. It sends out a TCP SYN packet destined to the IP address of http://www.google.com. • The WLC has rules configured for the client and hence can act as a proxy for http://www.google.com. It sends back a TCP SYN-ACK packet to the client with source as the IP address of www. google.com. The client sends back a TCP ACK packet in order to complete the three way TCP handshake and the TCP connection is fully established. • The client sends an HTTP GET packet destined to www. google.com. The WLC intercepts this packet and sends it for redirection handling. The HTTP application gateway prepares a HTML body and sends it back as the reply to the HTTP GET requested by the client. This HTML makes the client go to the default webpage URL of the WLC, for example, http://<Virtual-Server-IP>/login.html. • The client closes the TCP connection with the IP address, for example, www. google.com. • Now the client wants to go to http://2.2.2.2/login.html. Therefore, the client tries to open a TCP connection with the virtual IP address of the WLC. It sends a TCP SYN packet for 2.2.2.2 to the WLC. • The WLC responds back with a TCP SYN-ACK and the client sends back a TCP ACK to the WLC in order to complete the handshake. 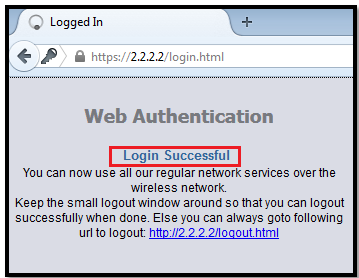 • The client sends a HTTP GET for /login.html destined to 2.2.2.2 in order to request for the login page. 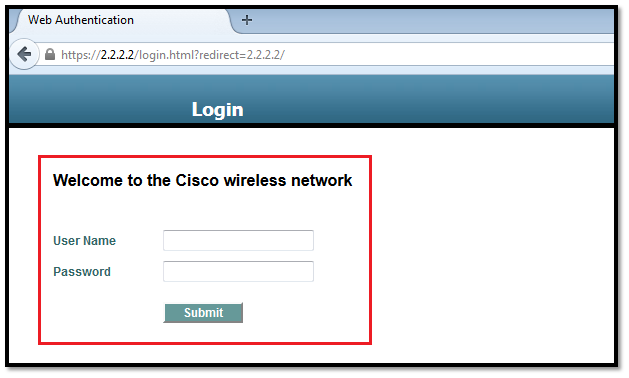 • This request is allowed up to the Web Server of the WLC, and the server responds back with the default login page. 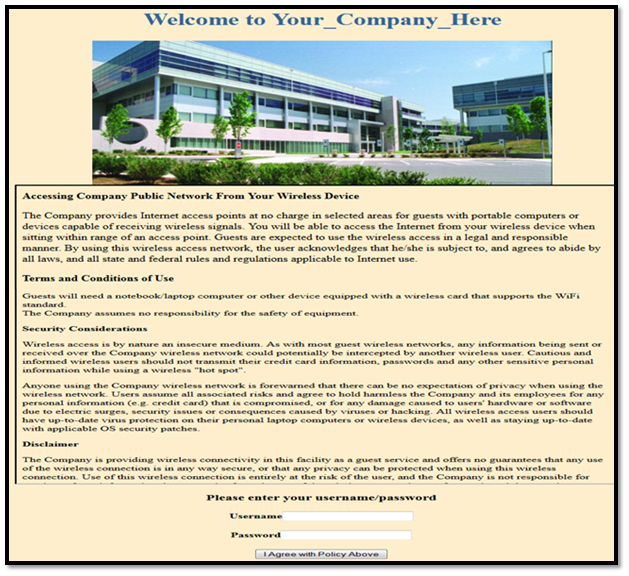 The client receives the login page on the browser window where the user can go ahead and log in. Debugs in WLC shows that it’s connected and getting an IP. But still it’s showing connected and getting IP. 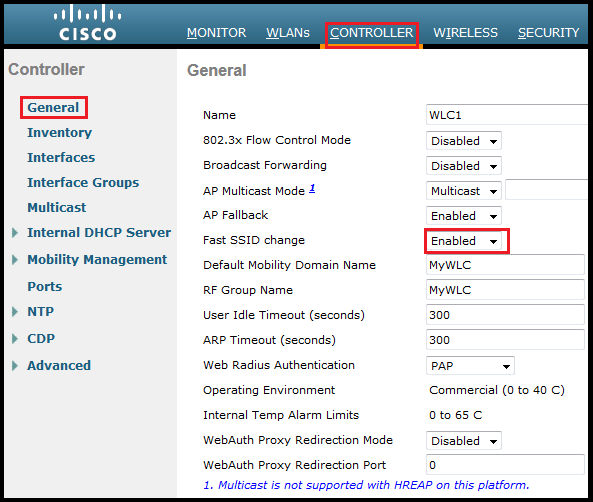 There is an option in WLC to enable FAST SSID change. By default its disable. 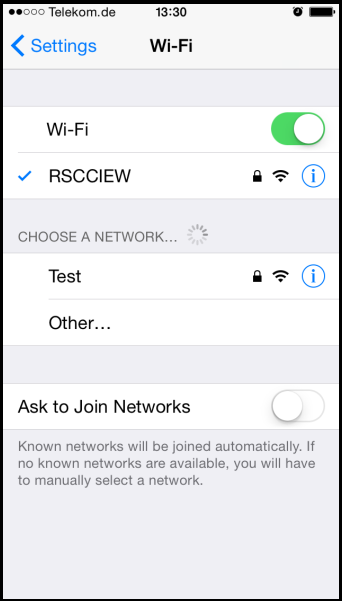 When fast SSID changing is enabled, the controller allows clients to move between SSIDs. When the client sends a new association for a different SSID, the client entry in the controller connection table is cleared before the client is added to the new SSID. When fast SSID changing is disabled, the controller enforces a delay before clients are allowed to move to a new SSID. 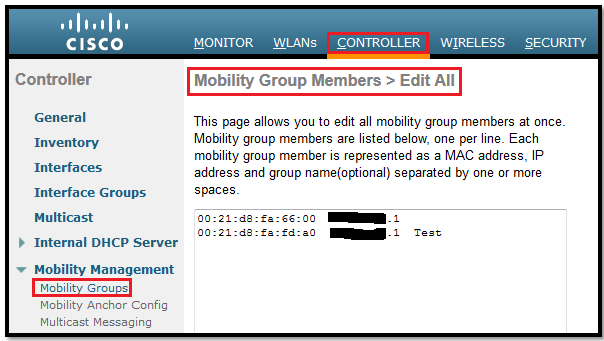 Login WLC GUI: Go to Controller to open the General page. Click Save Configuration on the right side on top. 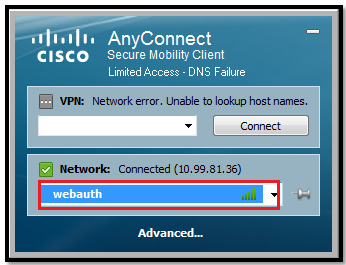 (WLC1) >config network fast-ssid-change ? Controllers and access points are designed for use in many countries with varying regulatory requirements. 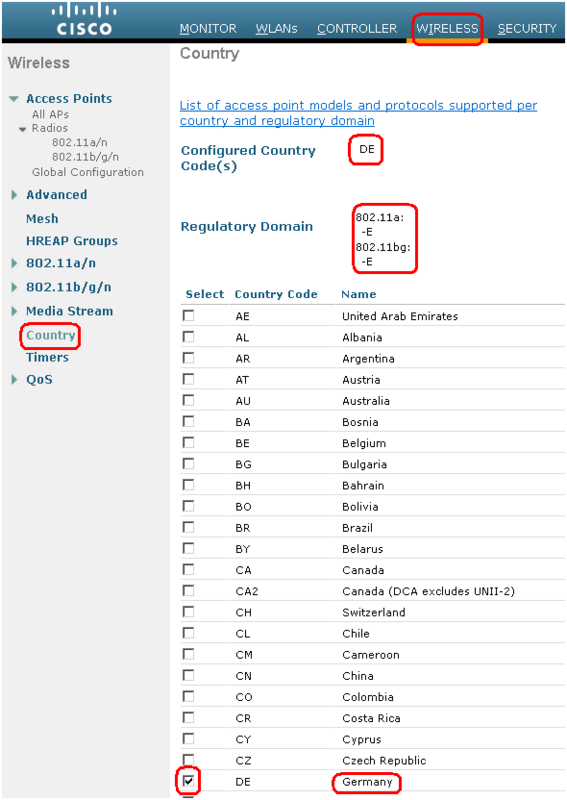 The radios within the access points are assigned to a specific regulatory domain at the factory (such as –E for Europe), but the country code enables you to specify a particular country of operation (such as FR for France or DE for Germany). Configuring a country code ensures that each radio’s broadcast frequency bands, interfaces, channels, and transmit power levels are compliant with country-specific regulations. Generally, we configure one country code per controller, the one matching the physical location of the controller and its access points. However, controller software release 4.1 or later releases allows us to configure up to 20 country codes per controller. This multiple-country support enables us to manage access points in various countries from a single controller. This rule is not application for MESH Access Points. *** Note: Mesh AP doesn’t support Multi country code on WLC. *** We can not change the country’s regulatory domain on Access Points, If by chance you bought the AP with wrong Regulatory domain then you must change or replace this Access Point. When the multiple-country feature is being used, all controllers that are going to join the same RF group must be configured with the same set of countries, configured in the same order. When multiple countries are configured and the RRM auto-RF feature is enabled, the RRM assigns the channels that are derived by performing a union of the allowed channels per the AP country code. The APs are assigned channels by the RRM based on their PID country code. APs are only allowed to use legal frequencies that match their PID country code. Ensure that your AP’s country code is legal in the country that it is deployed. The access point can only operate on the channels for the countries that they are designed for. The country list configured on the RF group leader determines what channels the members would operate on. This list is independent of what countries have been configured on the RF group members. 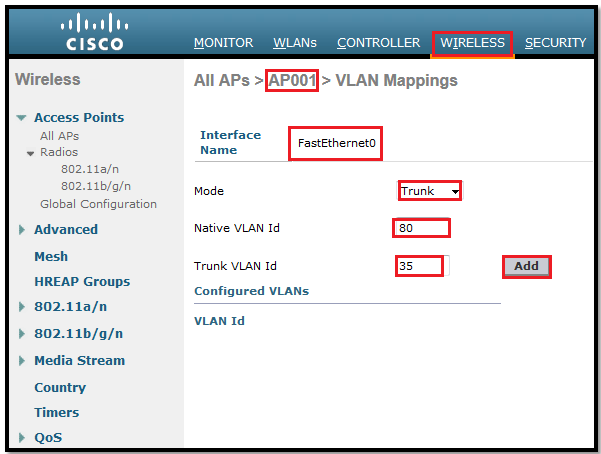 Step1: Choose Wireless> 802.11a/n > Network. 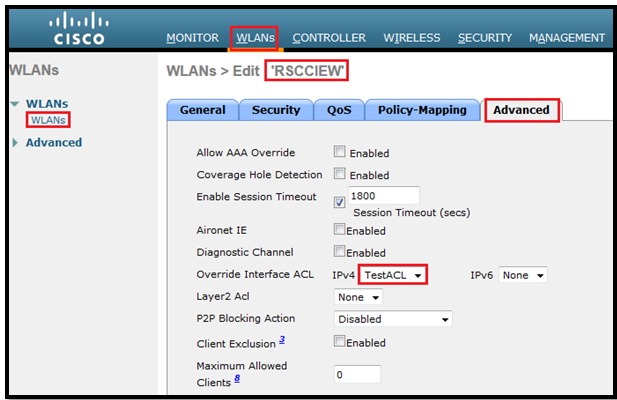 Unselect the 802.11a Network Status check box. 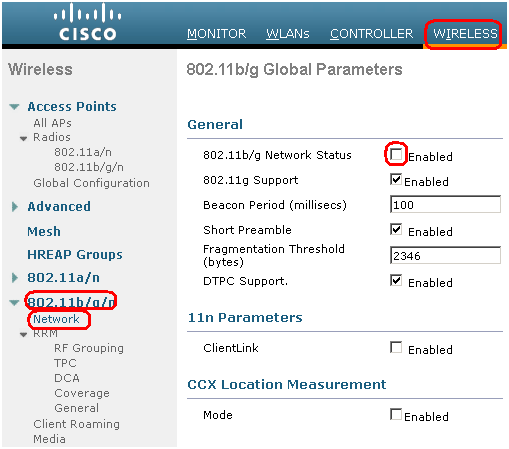 Step2: Choose Wireless > 802.11b/g/n > Network. 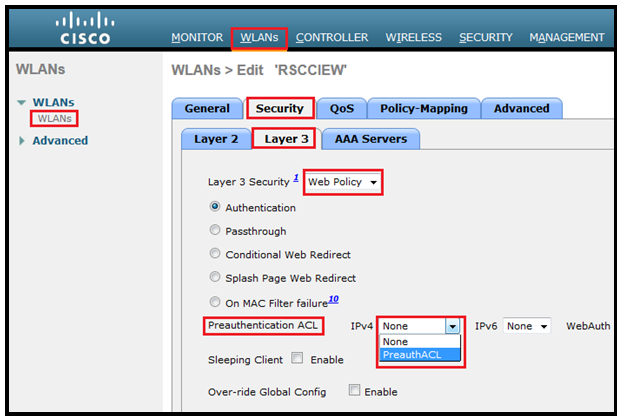 Unselect the 802.11b/g Network Status check box. Step3: Choose Wireless > Country, Select the check box for country where our access points are installed. If we selected more than one check box, a message appears indicating that RRM channels and power levels are limited to common channels and power levels. Here my all Access Points are in Europe domain and I am sitting in Germany so Choose DE(Germany). Here we chose only one Country so there is no other option for this AP. Step6: Click Save Configuration to save settings. Changing country code could reset channel & RRM grouping configuration. If running in RRM One-Time mode, reassign channels after this command. Check customized APs for valid channel values after this command. DE (-E   ,-E   ): A * * * * A * * * * A * * . MX (-A   ,-NA  ): A * * * * A * * * * A . . . US (-A   ,-AB  ): A * * * * A * * * * A . . .
Auto-RF         : C x x x x C x x x x C x x . DE (-E   ,-E   ): . A . A . A . A A A A A * * * * * * * * * * * . . . . .
DE (-E   ,-E   ): . . . . . . . . . . . . . . . . . . . . . . . . . .
Step3: We can choose country per AP (If we configured multiple country cod eon WLC). In my example I configured only DE, so No need to assign to specific AP.